Mud Mountain Dam Sedimentation Survey (WA) | WEST Consultants, Inc.
Before construction of the Mud Mountain Dam, the White River Valley experienced flooding almost every year. Therefore, in 1936, Congress authorized the construction of a dam on the White River to serve as a means of flood control for South King County and North Pierce County. 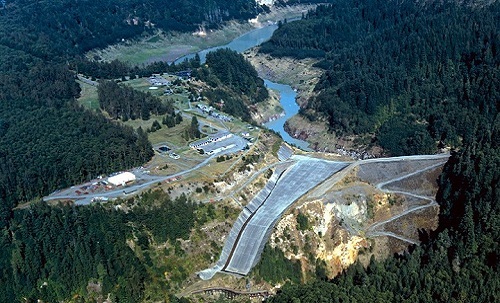 The Mud Mountain Dam, finished in 1948, is an earth filled dam, made of rock, sand, and gravel, and is located seven miles southeast of Enumclaw. It is estimated that the dam has prevented more than $300 million in damages that could have occurred from flooding. A sedimentation survey that began in 1946 established 64 cross-sections, including seven ranges for tributaries that are below the maximum pool elevation of 1,215 feet NGVD29. Surveying for approximately 25 of these ranges was conducted on a regular basis until 1986. WEST Consultants conducted a ground survey for these 25 ranges, obtaining cross-section data between valley walls to determine sediment aggradation or degradation for each location. New monuments at the cross-section end points were installed at the edge of the valley wall, replacing the original monuments situated above the maximum pool. WEST then provided a stream profile, obtaining Thalweg elevations at each range and at changes in slope of the stream bottom.